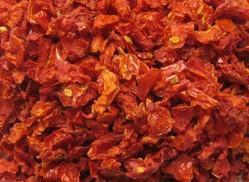 Pioneers in the industry, we offer dehydrated tomato (dried tomato) from India. We are the leading organization in the industry to provide our clients the best quality range of Dehydrated Tomato. The provided tomato is precisely processed by our skilled professionals using the best grade natural ingredients and modern technology. Offered tomato is available in different sizes packaging options as per the demands of our clients. Furthermore, our clients can avail this tomato at most affordable price. Our company engaged in processing and exporting of dehydrated tomato flakes and dehydrated tomato powder at worldwide.